While African American children’s literature was in short supply at the start of the twentieth century, white American writers published books for children that frequently portrayed black characters negatively (See our collection of Jim Crow children's literature and our collection of Joel Chandler Harris materials.) Negative images of African Americans were pervasive in elementary school readers and textbooks as well. A desire to redress the hurtful representations that black youths encountered in white-authored writing spurred the commitment of black authors of the 1920s to produce a children’s literature of their own. These authors were working during a time known as the Harlem Renaissance, spanning from about 1919 to about 1935, when black artists, musicians, and writers deliberately set out to produce cultural materials that reflected the varied cultural, historical, and political interests of African Americans. Understandably, one of its chief concerns was creating a literature for children and families that positively depicted black people. Here we have collected several of their efforts. In this editorial from the October 1919 Children's Number of The Crisis, W. E. B. Du Bois announces his plans to create The Brownies' Book, "a little magazine for children—for all children, but especially for ours, 'the Children of the Sun.'" Here we have edited an almost full run of The Brownies' Book, previously available only as selections. 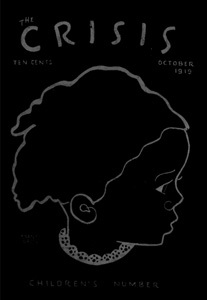 The Brownies' Book, running from 1920 through 1921, was the first large-scale attempt to publish a periodical for children of color. Collected by Alice Dunbar-Nelson, the prominent Harem Renaissance figure and widow of poet Paul Dunbar, The Dunbar Speaker and Entertainer offered topical and inspirational selections of writing mostly by black authors. The book was meant to provide instructive and uplifting reading and recitation material for young African American readers, with the foreword (by Leslie Pinckney Hill) explaining, “nothing is more important to the development of any people than the content of those printed pages on which they form their youthful minds.” At a time when black authors were rarely included in mainstream anthologies, Dunbar-Nelson reverses this imbalance, and includes some selections from white authors, marking them with an asterisk and making them visibly the minority. Silas X. Floyd's New Floyd's Flowers is an expansion of his earlier Floyd's Flowers or Duty and Beauty for Colored Children. Floyd, who had worked as an educator and contributed to various publications, offers a collection of short, uplifting, morally instructive stories for black children. The book is richly illustrated with photographs of African Americans by Underwood and Underwood, a popular agency for news photos that also provided many of the photographs in The Brownies Book.